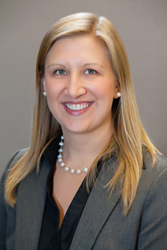 Jessica is a Partner at Sassetti LLC, and brings over 13 years of experience to the firm. She provides tax, audit, advisory, and accounting services to a diversified client base including publicly-traded and privately-held businesses, non-profit organizations, employee benefit plans sponsored by those entities, and family offices. In each client relationship, Jessica takes the time to understand every client’s goal and designs uniquely tailored strategies to ensure their organization thrives. She is a former winner of the Chicago Sky #RedefinePossible Women’s Leadership Award and the 2017 Influential Women in Business Award from The Daily Herald. Jessica graduated from Illinois Wesleyan University and holds a Bachelor of Arts in Accounting. She is an active member of the National Multiple Sclerosis Society, Greater Illinois Chapter, the Women’s Executive Committee for the Illinois CPA Society, Women’s Committee for the Technology and Manufacturing Association and the AICPA. Jessica enjoys spending time with her wife and keeping up with their four children. Her favorite pastimes are golfing, snow skiing, and rooting for the Chicago sports teams.